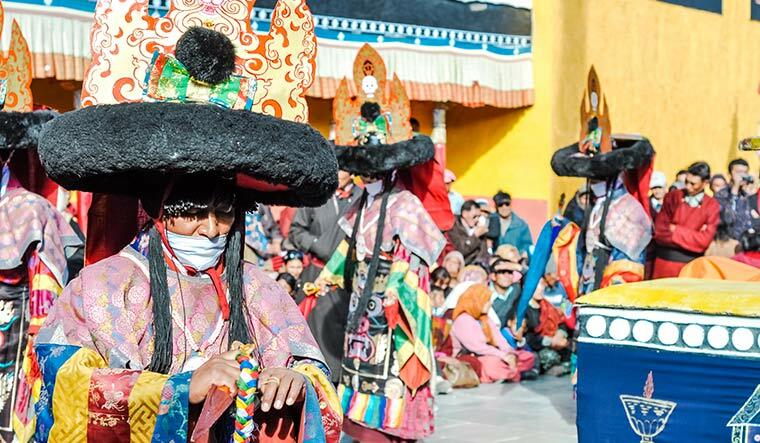 Hats off: the black hat ritual dance is the central feature of the cham dance at the thiksey monastery. THE NOTORIOUS TIBETAN KING Lang Darma was possessed by demons, say Buddhist legends. His reign lasted just four years (AD 838-842), but Buddhism suffered heavily under his rule—temples and monasteries were closed, Buddhist texts destroyed and monks and nuns executed. While meditating at a mountain retreat, Buddhist monk Lhalung Pelgyi Dorje had a vision to “liberate” the king from his evil karma. And so, he donned a cham (ritualistic dance performance) dress, picked up a bow and arrows and rode to Lhasa. There, he performed the cham, which was attended by the king. While holding his audience in thrall, Dorje shot the king with an arrow, midway through the dance. The king died, and with him ended the evil reign. 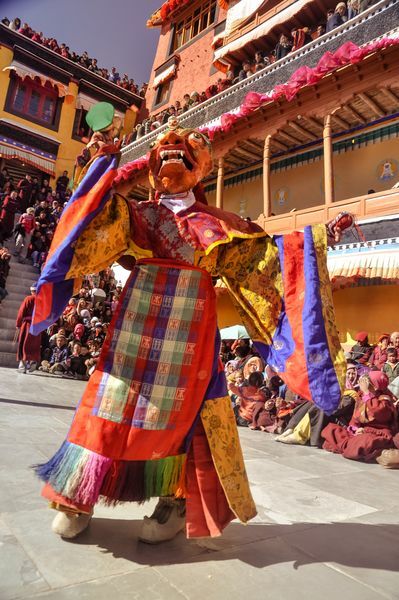 The killing of Lang Darma, who symbolises evil in Buddhist traditions, is the central theme of the Gustor festival in Ladakh. “The Tibetan form of Buddhism believes in non-violence.... [But] killing of evil beings like Lang Darma may be seen as part of a rational interpretation of the doctrine of ahimsa,” says K.T.S. Sarao, head, department of Buddhist studies, Delhi University. Every year, the three-day festival is held at a couple of monasteries in Ladakh, beginning on the 17th day of the ninth month of the Tibetan lunar calendar (October-November). Hidden moves: The cham dance is mostly performed using different masks. Ladakh is known as Little Tibet, and the Thiksey monastery is its Mini Potala, as the 12-storey complex resembles the Potala Palace in Lhasa—the former seat of the Dalai Lama. Painted in red, ochre and white, the monastery is perched high—at 11,800ft—on a hill, 19km east of Leh. The monastery belongs to the Gelugpa sect, also known as the Yellow Hats, and is a repository of Buddhist artefacts, thangkas (scroll paintings), wall paintings and swords. It also houses the biggest Buddha statute—15m tall—in Ladakh, at its Maitreya (future) Buddha temple, built in 1970. An assembly hall with a seat for the Dalai Lama, a nunnery and a Tara temple built in honour of Goddess Tara are a few attractions in the monastery complex. “The Gustor festival was started during the period of Nawang Namgyel—a prince who became the Rinpoche (head monk) of the monastery,” says Lama Tsondus, a monk at the Thiksey monastery. “The ceremonies of the Gustor festival start in the morning with a special prayer and synchronised chanting of Buddhist sutras. Thereafter, a liquid is offered to invite the devas of four quarters. As per the legends, by offering the liquid, the gods come to witness the mask dance [cham],” he says. The Black Hat ritual dance (shanak cham) is the central feature of the cham dance at Thiksey. The tantric ritual of cham was first performed by the Indian saint Padmasambhava, who was invited by the Tibetan king to combat the evil spirits in a monastery, around AD 760-770. “We perform the cham dance for world peace and to eliminate the cause of suffering—the ego,” says Tsondus. The most important ceremony of the Thiskey Gustor festival is the enactment of the killing of Lang Darma—known as argham—by the Black Hat dancers, says Sarao. An effigy of Lang Darma is made and it is infused with negative spirits through a series of rituals. “We do special puja [tantric prayers] for seven days for the rakshas [evil king] and prepare torma [a sacrificial cake], and on the last day we burn him in effigy,” says Tsondus. The killing of Lang Darma is marked by the breaking of torma by the leader of the Black Hat dancers. Towards the end of the festival, the torma is distributed by the Black Hat leader, commemorating the victory of good over evil. Thanks to the burning of the effigy and its theme of victory over evil, this Buddhist festival has a striking similarity to the Dussehra festival of the Hindus.